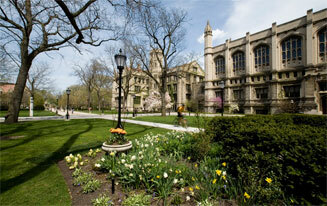 The University of Chicago is a world-class institution of higher education. Its mission is to produce a caliber of teaching and research that regularly leads to advances in fields such as medicine, biology, physics, economics, critical theory and public policy. Our Facilities Services team supports that mission through efforts to maintain and enhance the University campus and environment and provide superior client service to our community including faculty, students, staff, neighbors and visitors. In fall 2017, Facilities Services conducted a comprehensive Vision 2020 effort that included the senior leadership team, our clients, and our staff. Our plan outlines five themes and 16 transformative objectives that we will incorporate over the next few years. For more information about Vision 2020, click here. Our Vision: A National Leader In Higher Education Facilities Management. Our Mission: Together, We Create And Sustain Environments To Advance The Mission Of Our University. Service delivery is measured each time a service request is completed. We send a short survey to each requestor asking for feedback on four key areas: ease, professionalism, quality, and timeliness. The responses (on a 1-5 scale) and comments are tracked and addressed as necessary.